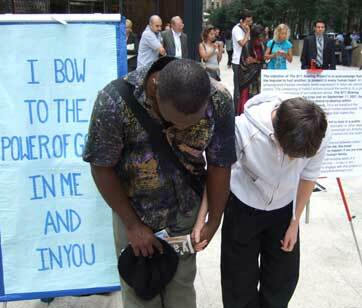 9/11 Bowing Journal: Who Is My Primary Employer? It’s so tempting. To turn off the news. Put blinders on. After all, it’s Ferguson, it’s Paris. it’s Benghazi. Far away. We’re safe here. Let’s just think positive. Bring more babies into the world. For me, it looks like I was meant to put in over-time this month. Not because I planned to. Just woke up on Saturday thinking it was the 11th and headed to my bowing station across from Bread Alone bakery. Everyone was home, my children were visiting, but none of us realized I was a day early. It was a useful bowing day. Though it took me a lot longer than usual to get centered. Until I said, It’s okay. If this is all I bring to the peace table today, my distracted physical presence, it’s enough. As soon as I said that, as soon as I let it be okay, a wave of memory washed over me. My body remembered what it felt like to walk out the door with a small charcoal sign that very first time in 2004. The despair and the desire. The sense of wanting to show up for someone. As if Peace was someone as helpless as I was. Standing at the center of some village green, waiting for me to join Her. It wasn’t until Saturday night, that I discovered my error and decided I was taking a day off from bowing on Sunday. After all, I’ve already put in my time. It didn’t work. My plan to play hooky didn’t work. Waking up on Sunday I had no choice. It was the 11th. Peace, my Primary Employer was expecting me. The smallest hole someone drills in that boat endangers every one of us. Some part of us knows it. Some part of us keep urging us to show up for Her. For Peace. Our Primary Employer. Who is your Primary Employer, and what does she expect from you? When I first read this post a week ago, I knew instantly whom I felt my employer was, but I wasn’t sure how to articulate it into words. For me this scenic path to parenthood, has resulted in true personal reflection about how I want to live my life. I see everything as so interconnected: the environment, food chain, politics, and MY fertility. When I allow it to unfold one step at a time and allow myself to be interested in whatever aspect of this is captivating me at the present moment (currently looking at my household waste), I am more at peace. It can be hard to maintain faith that these side steps, searching for less packaged fruit and veg (quite a challenge in Japan,) is leading me to our baby … but I KNOW it is connected. And then tonight I heard something on the radio that I felt gave me the nudge to just go ahead and say all this (some Mum’s talking ruefully about how they hadn’t considered what the plethora of ingredients in formula milk might actually be – that they had been swayed and frightened by marketing!). And I just know this questioning that is all the time rising up in me is right. I can be a better person when I live by my own guidance. I am finding “Lifting the Burden” on Imagery 2 very helpful right now. Yes, Ruth, we really can’t wait for the next study to show us what’s in the formula or in anything else. I love Lifting the Burden. Look forward to connecting later today! My current employer is constant motion. The kind that keeps me physically running, mentally wheels turning, never settling in until I drop with exhaustion each night. It’s not just my job, it’s my coping mechanism. So I would really like to try and work (part time to start – maybe one day a week?) for stillness and acceptance. Acceptance of where I’m at and that it’s where I’m supposed to be (as Julia pointed out on tonight’s call). And just trying to be…still. And let the body and the thoughts settle. Bailey, this is beautiful. Working for stillness and acceptance. I too have the constant motion coping mechanism. Acceptance of where I’m at. Just trying to be still. You said it so well. Thank you for sharing. I’ve had so many! For too long, my primary employer was panic. Dark, harsh, raw panic. Everything I did was guided by that dim light. I couldn’t even see that at the time, though. Most recently, I thought my primary employer was fear, which kept me frozen in place, afraid to do anything, afraid it was too late to do anything anyway so why bother. But lately, as in the last week or two, I’m wondering if there’s been a shakeup in upper management at FF Inc. It seems I might have a new boss, but I’m not sure I’ve met her yet. I’ve just gotten some of her inner-office memos, and they are not too bad. I believe my new employer’s name is Possibility. I am starting to see things in the world that don’t fit into statistical norms, that are yet should’t be, that work out despite every single thing working against them. I am just now starting to entertain the possibility that life can’t be boiled down into math equations, and fertility doesn’t belong on a chart. Many of the memos I’m getting from this new employer are short, but powerful: “Why not?” “What if the best-case scenario happens instead?” and “You choose how you react.” This, in turn, is sparking me to make tiny little changes along this journey because maybe all hope is not lost. Maybe it is possible to have another baby. Maybe it is possible for me to walk along this path instead of a dark, ugly, panicky one. In the call tonight, I wrote down that my primary employer was fear, and she said, “this won’t happen.” She was telling me that this baby is not going to show up, and then I heard her voice in a different way. With her arms crossed, she was mad, and she was putting me down. “This isn’t gonna happen, you know.” I had been telling myself “what’s the use of trying, you’ve been trying for three years and it’s not gonna happen for you. Those things only happen to other people.” That orphan in me was still there, for me to love and have compassion for. Thank you veronica for this wonderful post.I have the same orphan. I feel like my current employer is doubt and fear. I fear that at this point IVF is out only choice. But it is an orphan that I have to love and accept.I guess it doesn’t matter how we attain our goals as long as we learn something about ourselves along the way. I have read and re-read this blog. I am not sure I can name her, but I feel like my current employer is regret. I have been mulling over life choices at this time and I feel like this mistress of regret is keeping me pretty busy doing the ” you should have.. you could have.. why didn’t you…” dance. My primary employer is none other then my truest self. The OH that lets herself feel the orphans and give them light and the part of me that sees my v and rejoices in her growth. All of these parts that can be derailed by the part of me that does not want to dig deeper because the truth might hurt. K- I recently read that same quote and it resonated so deep within me and reminded me of those beautiful orphans! My primary employer previously was fear. Fear of engaging which now digging deeper I realize is fear of being judged or ridiculed by “others out there”. I can see how it was a family line fear now and passed on from generation to generation. I am choosing as my new employer hope. And not the RA RA let it all be ok hope. But the hope of trust – trust I can walk this new path. Trust I can trust myself to walk this path and allow myself to slip up without ridiculing myself. Hope that I can continue to learn and grow and find the safe place to allow my fears to be known instead of trying to hide them and stuff them away like nothing is wrong. I read one of MLK’s quotes today: Darkness cannot drive out darkness; only light can do that. Hate cannot drive out hate; only love can do that. I guess we do this with our orphans? love them allow them to be heard and into the light. bring peace to ourselves and bring peace to the world. Katy, reading this as one of the humble teachers of this new path, I’m inwardly cheering, thrilled that some of the ideas I attempt to transmit are making sense. And I think of Life as a Teacher cheering for us when some of the lessons finally start getting through and we get what She’s been trying to say all along. Thank you for taking me up on the challenge to engage; taking up Life on the challenge to be born into your fully fertile gorgeousness. And thank you for that beautiful quote. Katy, that was beautifully said. I agree with you that hope is my primary employer, and also faith. Hope that I can and will make it out of this dark place I am in right now, and faith that this path I am on will lead to creating something beautiful and meaningful to myself and ultimately the world as well. When I first read the blog I wasn’t sure I understood what Julia meant as our primary employer but you hit the nail on the head and I see it clearly now! I think my primary employer has been shame. I thought I have overcome that but reading this shows me that she still has authority over me. I agree Lori, only after reading Katy’s and OH’s response, I too understood what Julia meant. Thank you MH, Lori and Tanya and Julia! It is nice hearing you cheers!